The Arclight is the last defense. The Fade can’t get in. Outside the Arclight’s border of high-powered beams is the Dark. And between the Light and the Dark is the Grey, a narrow, barren no-man’s-land. That’s where the rescue team finds Marina, a lone teenage girl with no memory of the horrors she faced or the family she lost. Marina is the only person who has ever survived an encounter with the Fade. She’s the first hope humanity has had in generations, but she could also be the catalyst for their final destruction. Because the Fade will stop at nothing to get her back. Marina knows it. Tobin, who’s determined to take his revenge on the Fade, knows it. Anne-Marie, who just wishes it were all over, knows it.When one of the Fade infiltrates the Arclight and Marina recognizes it, she will begin to unlock secrets she didn’t even know she had. Who will Marina become? Who can she never be again?" 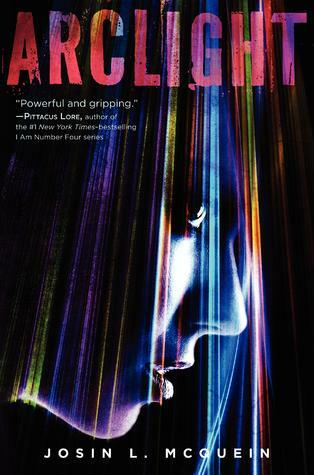 Arclight is decidedly YA, but combines elements of dystopian, science fiction, and thriller. It was better than I expected, although the pace did a bit of wandering at times, and I greatly disliked the main male character (who is underdeveloped). The concept of the Fade are both terrifying and potentially possible. And, like every dystopian, there's the questioning of the established order and regime. I guessed Marina's circumstances midway through the novel, but I was surprised at the expanded concept of the Fade, and their culture. Although Marina was, at times, glib to the point of out-of-character, and cynical to the point of annoying, and trusting to the point of naivety, I liked how she handled events as they went spiraling out of her control. I don't want to give too much away, but suffice to say I didn't want her to do what she ended up doing, and I really wanted to know more about Cherish. I identified pretty strongly with Ann-Marie, and would have liked the last quarter of the book to be developed far more than it was (I kept asking "how?!" as the plot raced ahead, heedless of logic). I'd recommend this for fans of YA dystopian and YA sci-fi books.